Perhaps no single person of the 20th century has done more to preserve, broadcast and redistribute folk music than Pete Seeger. His passion for politics, the environment, and humanity have earned him both ardent fans and vocal enemies since he first began performing in the 1930s. 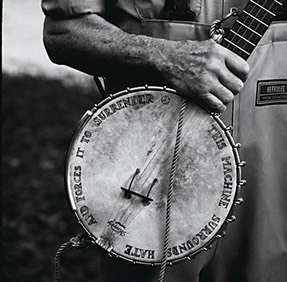 For nearly 70 years as a performer Seeger embodied the ideals of folk music - communication, entertainment, social comment, historical continuity, inclusiveness. The songs he has written, and those he has shared, have helped preserve our cultural heritage, inspiring adults and children with the sounds, traditions and values of our global past and present. The program features Mark Dvorak leading the audience through some of Pete Seeger’s best-known songs. “If I Had a Hammer,” “Where Have All the Flowers Gone?,” “Kisses Sweeter Than Wine,” “Turn, Turn, Turn” and others that have become standard in the American folk repertoire. Dvorak , who performed with Seeger on a handful of occasions, includes personal anecdotes and stories by and about Seeger, to the narrative. The program is typically one hour in duration. Chicago’s Mark Dvorak has followed in the footsteps of Pete Seeger as a musician, songwriter, educator and community builder. He toured for six years with WeaverMania! LIVE performing Seeger’s role as singer, storyteller and banjo player. Dvorak has been active on the faculty of the Old Town School of Folk Music for more than twenty-five years where he is currently Artist-In-Residence. He has performed in nearly all of the United States and released seventeen albums of traditional and original music. In 2008 Dvorak received the Woodstock Folk Festival Lifetime Achievement Award and in 2012 WFMT 98.7 fm Fine Arts Radio named him “Chicago’s official troubadour.” In 2013 he received the FARM Lantern Bearer Award from Folk Alliance International. Turn, Turn, Turn performed at the Old Town School of Folk Music, Chicago IL April 24, 2016. Download & print a one sheet .pdf here.